Ah, the Black Knight - all 82 pounds of him, along with the neatest looking sword for battle: the back lit Sony LCD remote. Yes, I had the pleasure of uncrating and wiring up the new Sony TAE9000es preamplifier (The Black Knight) and his obedient horse, the TAN9000es amplifier. After dismantling my reference system, I decided to do a little spring maintenance on the audio display by cleaning up all sorts forgotten dust and bits of wire. After all, I had a guest coming and I wanted to make sure everything was fresh and clean. As it turns out, all the fuss was well worth it. eh, sorry Sir Galahad. The unit includes five optical inputs along with one optical output and also sported three coax ins. Upon gazing a little further seven S-inputs, four S-outputs and eight preamplifier outputs were also present. Thats not all! Look even further and you'll notice the AC3RF input for Laserdisc (needed for Dolby Digital playback on LDs) was there, too. One normally would think enough already, but there are two more things worth mentioning: Sony even included a RS232C multi-pin connector on the back of the TAE9000, along with a microphone analyzer input. Wow! Quite impressive. One would think Sony is trying to cover all the bases against possible obsolescence. The manual, strangely enough, made no mention of the microphone analyzer input. I found RS232C connector an interesting concept, since Sony indicates that the units internal software can be upgraded at any time in the near future. A great concept! It has happened so often over the last few years that electronic gear has become obsolete over night. A good example of this is the new DTS craze that all the manufacturers are offering on their components. Im sure that there are some of you out there that are a little perturbed by your recent investment over the last year or two, only to find out that you need to upgrade to get DTS! If Sony holds true to its word with this software update then they deserve to gain some attention with the TAE9000. Of course this black beauty sports all of the latest in surround technology, right from good old Pro-Logic, Dolby Digital and of course &horbar; DTS. Sony has also incorporated its own Digital Cinema Sound as well as MPEG playback, used a lot in European DVDs. There are countless of settings and enough surround parameters to intimidate the faint of heart. Yet sophisticated as this unit is, it is quite easy to use the front panel controls. Housed there are four large rotary dials; one controls the menu for the various settings, the second is a plus/minus control with emphasis or de-emphasis of surround effect levels (such as delay, reverberation, wall absorption etc). The third control is the input select switcher and of course the fourth is for main volume control.All these controls had a smooth and solid feel to them and were nice and quiet when turned to a preferred setting. Along with the dials are small chrome buttons that control the parametric equalizer, the auto format function (more on this later), again another plus/minus function for frequency control, a two channel mode set, audio split setting, which allows one to change the audio function from the video setting. This is a handy feature, which allows you to keep your video source while selecting, say the CD sound or any other sound sources at the same time. There is a chrome button to set either for digital or analogue mode, if for some reason you dont trust the auto format setting. I liked the auto format function and not having to figure out or set the proper type of input, such as Dolby Digital, DTS or plain optical signals. Setting the TAE9000 for auto format is a wonderful convenience and made its operation a lot less confusing. The units readout display is large and easy to read from across the room. This is a blessing since the unit did not appear to have an on screen (TV) display. The front panel display also was helpful in the way it indicated what kind of signal, especially a digital one, the preamp was decoding;, I found this rather interesting. As for the processing power available, Sonys preamp is second to none. There's so much power I was surprised there was no cooling fan used like that in a PC. There are no less than three 32 bit DSP (Digital Sound Processing) chips used, each doing immense calculations, not only to provide excellent sound quality, but also to enable a myriad of surround manipulations. As I went through some of the factory surround settings, it was a joy not to hear overly emphasized and inaccurate ambience effects. 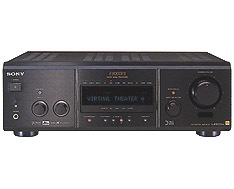 The TAE9000ES even boasts virtual surround settings for those who do not have rear speakers or if one has a single pair of surrounds it can be virtually increased to multi speakers, like that of a commercial theatre. As for the horsepower, the TAN9000ES came in on the weigh scale at 52 lbs and boasts 115 watts x 5 channels RMS into four or eight ohms. 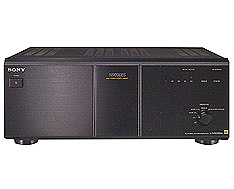 The unit uses discrete channel amplification and can be set in a few different configurations. Among the choices were 2,3,4 or 5 channel settings, which allows one to set up different combinations depending on the number of amplifiers one wishes to use. You can even bridge together four of the amps, for a total of 200 watts x 2 and have the third amp left to pump out 120 watts to run either a center channel speaker or a passive subwoofer. I did find Sonys specifications in the bridged mode surpising, however. The manual indicated that the 200-watt rating x 2 channels was arrived at the 1KHz measurement, and not at the flat out range of 20-20,000 Hz. Sony even included a warm up setting which puts the amp in idle mode but keeps the amplifier circuits from cooling down. This way sound quality is maintained when youre ready to put the system through its paces. I found that it was easier to keep the amplifier on instead of having to manually keep switching the unit into its warm-up mode. It could be a useful setting if you were planning to leave the unit unattended longer periods of time. The units rugged build incorporates heavy-duty five-way binding posts for any type of speaker connection. The chassis was designed with frame and beam construction for rigidity and could withstand the pressure levels of the Titanic if it sat on the TAN9000s top. Now for the cool part of the package, the nifty LCD remote! I have to admit I certainly like the design behind this remote, it was straightforward to use, comfy to hold and Sonys execution is just about perfect. A couple of quibbles surfaced though, especially when it comes to the remotes back light display. In one word - D I M. I found it totally unreadable during the day, since my home theatre setup does not have the luxury of controllable lighting, I found this somewhat of an annoyance. Glare would consistently wash away the display, no matter how much I tuned the contrast level on the remote. Now dont get me wrong; in a controlled lighting situation this would not be much of a problem. The Sony ES combination would normally find its way into dedicated home theatre rooms anyway and this will not be a big deal for most people. I just felt that the remote back light display could have been brighter since my other Sony RMAV2000 remote has enough illumination that it could prevent ships from hitting the shoreline at night! If it werent for this weakness the remote would be perfect. The TAE9000es remote also included a touch pen for control if one prefers; unfortunately it is one of those things that can mysteriously disappear.Fortunately the remotes panel is touch sensitive and can be easily used by fingers. I also liked the units smart component menu that can operate other manufacturers gear without doing the "head to head" training thing or having to look up a bunch of codes. All you have to do is call up the device you want to use and scroll for the correct manufacturer and &horbar; Bingo! - you're off to the races. Now for the audition! I was curious to hear how DTS would sound so I played Dragonheart on DVD, a version of which was encoded for this forma,t and I found the introductory logo for DTS impressive. Sounds swirled around the room to show off the separation and detail of the DTS format and the 9000es series handles it with aplomb. As for the movie, voices were well articulated and clean without the chestiness that sometimes can be directed from the center channel. On chapter 9, where Draco the Dragon (played by Sean Connery) battles the Knight (Dennis Quaid), one could clearly hear the blast of fireballs bellowing from left, center, right, rear right and left speakers. It was as if Draco were flying overhead in my own living room while spitting fire balls towards me. I was glad that I wore my asbestos suit. I noticed the Sony amp kept up with the bass demands and kept things nice and tight without any of the boominess of some home theatre systems. As for Godzilla, which I had in Dolby Digital, for kicks I chose the "Night Theatre" setting on the TAE9000; since the night was getting on, it was interesting to see if I could still enjoy reasonable sound pressure levels without upsetting the neighbours. The Night Theatre setting compress sound levels so that one can still get good surround without totally losing the dynamics. Well, I was impressed with this setting and I did not even disturb the wife, who chose to turn in rather that watch Godzilla as he (I guess its really as she) tromped on New York City. Normally my wife would close the bedroom door to filter out the sound pressure level, but this time she left the door open and didnt even complain the next day. Marvelous! Unfortunately I was unable to test DTS or 5.1 surround music discs and could not conclude the quality of reproduction, but from some of the regular music I was able to play the Sony did a masterful job. I would have like to have been able to match up different amplifiers with the TAE9000 but our test time was very short indeed. This is not to say that the TAN9000 amplifier did not perform admirably, but its always nice to hear the subtle differences between components. All said, I would highly recommend this Black Knight to save the day in the home theatre arena, it not only can joust with the best of them but it can fence with rapier-like precision in terms of sound quality. At $3499 Canadian the Sony TAE900ES preamp is a bargain and may even hold its lustre a while longer than most units, thanks to its upgradeable RS232 port. As long as Sony makes the software upgrades available, then, this would be an attractive choice. As for the $2999Cdn price of the TAN9000ES amplifier, it too can deliver but it would be interesting to match the preamp with other designs for comparison but that may jog the price upwards somewhat. The combination of both units would do a Home Theatre room proud! My only regret is that I would have liked the pleasure of his visit a little longer and had a little more time to get acquainted.